CNN says Bonnie and Clyde once inspired fans for the same reasons Assange motivates supporters today. This week, Jotman's Fox News Award* goes to CNN for its coverage of Julian Assange and WikiLeaks. It would appear that CNN had it in for WikiLeaks ever since the organization entered the national spotlight back in April. That's when I posted my first blog reports (here and here) on CNN's atrocious coverage of WikiLeaks. Well, CNN is still at it. A former FBI profiler says that for some Assange is a modern day hero... Routing for the notorious is nothing new. 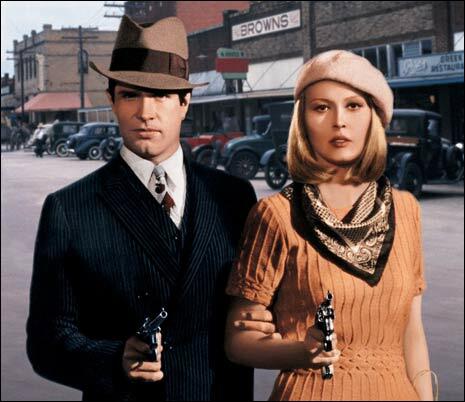 At first real life bank-robbers Bonnie and Clyde captivated the public and Hollywood glamarized the crime spree... But the fan based dried-up when robbery victims started dying. The so-called Barefoot Bandit created a fan base without killing anybody... Fugitive John Robert Boon could pass for Santa Clause is a legendary Kentucky pot farmer. Authorities say supporters won't give him up and have sold "run Johnny run" T-shirts. "This is just a variation on rooting for the underdog, this is just a twist on that." (expert) A fan base can boost an ego or provide encouragement, but it can also get in the way of trying to stop someone accused of breaking the law." Susan Candiotti, CNN, New York. In Susan Candiotti's CNN report, supporters of WikiLeaks are Assange "fans." There's no suggestion by CNN's Candiotti that WikiLeaks supporters are motivated by anything more than a desire to "root for the underdog." Candiotti did not bother to inform CNN viewers that many WikiLeaks supporters are motivated by the very principles on which the United States was founded; that among the values that have led people from all over the world to support Assange and WikiLeaks are free speech, belief in the Constitution, net neutrality, human rights, openness and transparency in governance, press freedom, protection of whistle-blowers, and journalistic ethics. Not quoted by CNN was Secretary of Defense Robert Gates who told reporters, "Is this embarrassing? Yes. Is it awkward? Yes. Consequences for U.S. foreign policy? I think fairly modest." *The Fox News Award is a feature at Jotman.com that began early 2008. It goes to a media organization that has gone the extra mile during the course of the week to make the public more stupid. (Otherwise corrupting the ethic of creativity and global citizenship.) Some past winners.